So yesterday was the last day of the stationery show, and I've definitely felt like a girl of all work these past couple of days! It was great seeing old friends and meeting new people, and we got fantastic response to our new products (these will be up on our site in about a month). After taking down the booth and packing all our stuff, we were exhausted! The only remedy was a trip down to Takashimaya, the upscale japanese department store that, unfortunately, is closing its doors for good in June. 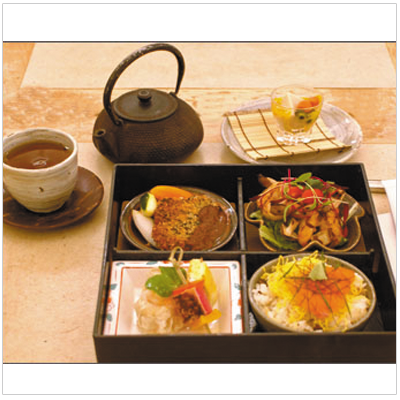 My sister treated me to afternoon tea there,where we sampled their sweet bento boxes and their sampling of sandwiches. It was perfect for perking us up and celebrating the end of a great showing here at New York! Any suggestions for patio tabletop sets? Hmm...I'll see what I can pull up in a future post!